1. There is no remedy for love but to love more. 2. May we so love as never to have occasion to repent of our love! 3. Pursue some path, however narrow and crooked, in which you can walk with love and reverence. 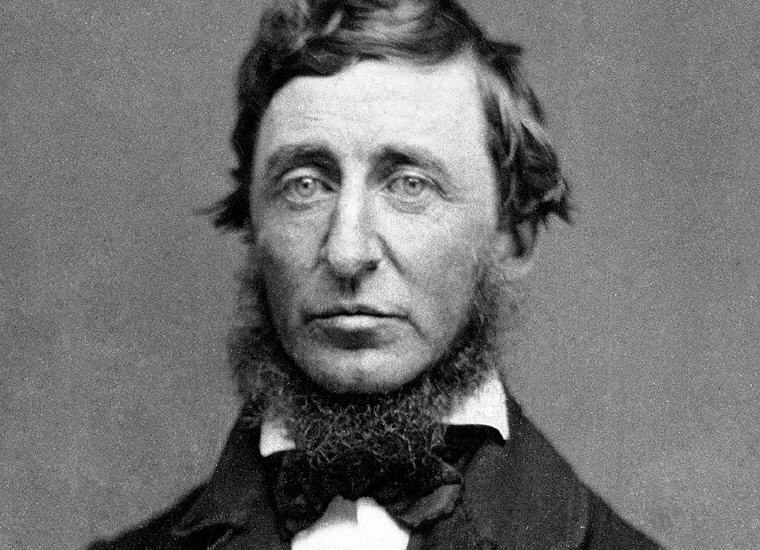 Excerpt from Wikipedia: Henry David Thoreau (born David Henry Thoreau; July 12, 1817 – May 6, 1862) was an American author, poet, abolitionist, naturalist, tax resister, development critic, surveyor, historian, philosopher, and leading transcendentalist. He is best known for his book Walden, a reflection upon simple living in natural surroundings, and his essay, Civil Disobedience, an argument for individual resistance to civil government in moral opposition to an unjust state. 1. A truly good book attracts very little favor to itself. It is so true that it teaches me better than to read it. I must soon lay it down and commence living on its hint. 2. What I began by reading I must finish by acting. 3. However mean your life is, meet it and live it; do not shun it and call it hard names. It is not so bad as you are. It looks poorest when you are richest. The fault-finder will find faults even in paradise. 4. I do not see but a quiet mind may live as contentedly there, and have as cheering thoughts, as in a palace. 5. An early morning walk is a blessing for the whole day. 6. Have no mean hours, but be grateful for every hour, and accept what it brings. The reality will make any sincere record respectable. No day will have been wholly misspent, if one sincere, thoughtful page has been written. 7. If you have built castles in the air, your work need not be lost; that is where they should be. Now put the foundations under them. 8. Do not hire a man who does your work for money, but him who does it for love of it. 9. The community has no bribe that will tempt a wise man. You may raise money enough to tunnel a mountain, but you cannot raise money enough to hire a man who is minding his own business. An efficient and valuable man does what he can, whether the community pay him for it or not. The inefficient offer their inefficiency to the highest bidder, and are forever expecting to be put into office. One would suppose that they were rarely disappointed. 10. Dreams are the touchstones of our characters. 11. It takes two to speak the truth, — one to speak, and another to hear. 12. How vain it is to sit down to write when you have not stood up to live. 13. I never found the companion that was so companionable as solitude. We are for the most part more lonely when we go abroad among men than when we stay in our chambers. A man thinking or working is always alone, let him be where he will. Solitude is not measured by the miles of space that intervene between a man and his fellows. The really diligent student in one of the crowded hives of Cambridge College is as solitary as a dervish in the desert. 14. If we will be quiet and ready enough, we shall find compensation in every disappointment. 15. If you would convince a man that he does wrong, do right. But do not care to convince him. Men will believe what they see. Let them see. 16. In the long run men hit only what they aim at. Therefore, though they should fail immediately, they had better aim at something high. 17. It is not enough to be busy. So are the ants. The question is: What are we busy about? 18. It is only when we forget all our learning that we begin to know. 19. What a man thinks of himself, that it is which determines, or rather indicates, his fate. 20. I learned this, at least, by my experiment: that if one advances confidently in the direction of his dreams, and endeavors to live the life which he has imagined, he will meet with a success unexpected in common hours. 21. Not till we are lost, in other words, not till we have lost the world, do we begin to find ourselves, and realize where we are and the infinite extent of our relations. 22. You who govern public affairs, what need have you to employ punishments? Love virtue, and the people will be virtuous. The virtues of a superior man are like the wind; the virtues of a common man are like the grass; the grass, when the wind passes over it, bends. 23. Nature and human life are as various as our several constitutions. Who shall say what prospect life offers to another? Could a greater miracle take place than for us to look through each other’s eyes for an instant? 24. To affect the quality of the day, that is the highest of arts. Every man is tasked to make his life, even in its details, worthy of the contemplation of his most elevated and critical hour. 25. What is the use of a house if you haven’t got a tolerable planet to put it on? — If you cannot tolerate the planet that it is on? 26. I am grateful for what I am and have. My thanksgiving is perpetual. It is surprising how contented one can be with nothing definite — only a sense of existence. 27. It is not worth the while to let our imperfections disturb us always. The conscience really does not, and ought not to, monopolize the whole of our lives, any more than the heart or the head. 28. Do not be too moral. You may cheat yourself out of much life so. Aim above morality. Be not simply good—be good for something. 30. All men are children, and of one family. The same tale sends them all to bed, and wakes them in the morning. 31. The mass of men lead lives of quiet desperation. What is called resignation is confirmed desperation. 32. Most of the luxuries, and many of the so-called comforts of life, are not only not indispensable, but positive hindrances to the elevation of mankind. 33. While civilization has been improving our houses, it has not equally improved the men who are to inhabit them. It has created palaces, but it was not so easy to create noblemen and kings. 34. Be sure that you give the poor the aid they most need, though it be your example which leaves them far behind. If you give money, spend yourself with it, and do not merely abandon it to them. We make curious mistakes sometimes. Often the poor man is not so cold and hungry as he is dirty and ragged and gross. It is partly his taste, and not merely his misfortune. If you give him money, he will perhaps buy more rags with it. 35. Above all, as I have implied, the man who goes alone can start today; but he who travels with another must wait till that other is ready, and it may be a long time before they get off. 36. Every man is the builder of a temple, called his body, to the god he worships, after a style purely his own, nor can he get off by hammering marble instead. We are all sculptors and painters, and our material is our own flesh and blood and bones. 37. That virtue we appreciate is as much ours as another’s. We see so much only as we possess. 38. We are as much as we see. Faith is sight and knowledge. The hands only serve the eyes. 39. One cannot too soon forget his errors and misdemeanors. To dwell long upon them is to add to the offense. Repentance and sorrow can only be displaced by something better, which is as free and original as if they had not been. 40. The perception of beauty is a moral test. 41. That man is richest whose pleasures are the cheapest. 42. What I have to do is to see, at any rate, that I do not lend myself to the wrong which I condemn. 43. There is just as much beauty visible to us in the landscape as we are prepared to appreciate,—not a grain more. 44. October is the month of painted leaves. Their rich glow now flashes round the world. As fruits and leaves and the day itself acquire a bright tint just before they fall, so the year near its setting. October is its sunset sky; November the later twilight. 1. Those whom we can love, we can hate; to others we are indifferent. 2. Love is an attempt to change a piece of a dream-world into a reality. 3. Live your beliefs and you can turn the world around. 4. I can alter my life by altering my attitude. He who would have nothing to do with thorns must never attempt to gather flowers.